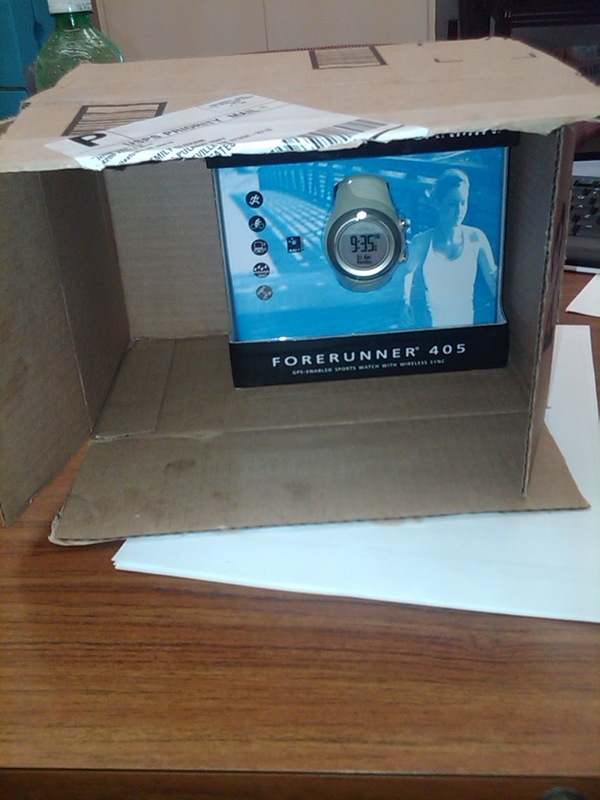 Today's post is brought to you by the Forerunner 405, my Christmas present that I was not going to talk about and pretend like it was a surprise on Christmas morning, but....well....I used it today so I thought it was only fair to admit that I am getting one and I am already using it!!!! Annnnnyway....this morning was the final long run before the Marathon and the first long run that I have had to do by myself. This is the first time I have had to run a long run by myself, it was actually the first of a few that I have had to run alone, long or short. I did not get the entire 20 miles, I had to stop at 18 to get ready for work. I just ran out of time, but all in all it was a great run. I could have gone two more miles, I could have gone 8 more miles. It felt good and I never felt like I needed to quit. I did see my sister driving down the road about mile 15 and told her that I needed a ride home, but all in good fun, she wouldn't have taken me anyway. Today was by far the coldest run I have had thus far. While I was running and the mile points were clicking away the blog post was just writing itself with key phrases, "Hurricane winds," "Artic Chill" but in an attempt to not be too dramatic I will just say it was very very cold and no matter what direction I was running in the wind seemed to be blowing at my face. I was sure I was going to have chapped skin but I have only ended up with chapped lips. I actually came inside about mile 10 to get a drink and warm up for a few minutes before I went back out for the second 10. At about mile 16 I decided I was hungry, really really hungry. I could have stopped right there in the road and had a little snack...and now that I think on it I actually finished off my Power Chews right around that point. I started making a list of all the things I was going to have for lunch: sandwich, cookies, potato chips, cereal, M&M's, Chex Mix...the list went on and on. I don't know that I have ever gotten that hungry while in the middle of a run. I couldn't get my mind off of it. About mile 17 I realized that I was not going to have enough time to finish the 20 miles but I would run at least the 18 and try for 19 but that last one was going to be a stretch. I am so happy I packed my clothes just in case last night so I didn't have to drive home and shower and get dressed, if that had been the case I probably would have only gotten about 16 miles in. Then it was a mad dash to shower change and go get lunch, the shopping trip for lunch could have taken 45 minutes if I bought all the stuff I wanted. I pulled into Wal-Mart to get lunch because I needed to get cereal for breakfast as well as food for lunch. My bones were already starting to hurt and get stiff. While looking for a parking spot I felt a wave of tears....no close parking spots. I was going to have to walk another mile and a half just to get in the store. I composed myself and decided to drive around again, surely there is no need for that many people to need something at Wal Mart in the middle of the day. After my second trip around one little tear escaped as I noticed I was not going to get a close parking spot. It seemed like the longest walk in and around the store but I got lunch minus about 50 of the items that I was sure I was going to eat. It ended up being a balanced little lunch....with cookies! I am feeling amazingly well after this run. I am a little bit tight because I didnt get to stretch like I would have liked to due to lack of time, but I do feel pretty good. A little bit euphoric because I completed it alone and its the last long run. Basically I have this big ol grin plastered across my face! You never know with me, its only 5pm and I already posted I might have more to say tonight. Well done on doing your first long run! I am about to start training for a half marathon and that's scary enough for me! 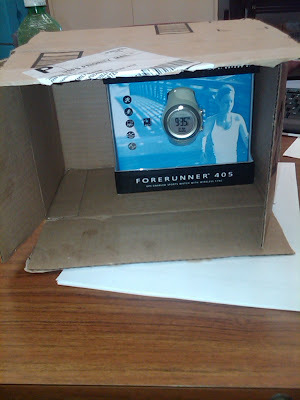 Chris surprised me with a new forerunner for our anniversary! I'll have to use it on our run Friday!